April 14th to April 18th 2014 is Chiropractic Awareness Week. 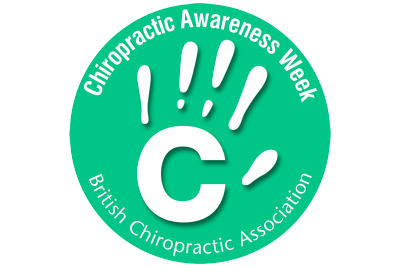 This week is run by the British Chiropractic Association, and the focus this year is on spinal pain in young people. Recent research from the Royal College of Chiropractors demonstrates that 40% of 11 to 16 year olds experience back or neck pain. This worrying statistic is corroborated by other research demonstrating degenerative changes are visible in the necks of young people, a finding normally associated with age and “wear and tear”. The cause of increasing prevalence of spinal pain has not been confirmed, but it is thought to be related to sedentary lifestyles and excess time spent using electronic gadgets such as tablet PCs and smart phones. Correct posture depends on taking regular exercise. The way in which bones and muscles develop depends on the types of strains they are placed under whilst growing. Lack of challenge leads to weak muscles, whilst repetitive use of poor postures can cause muscle imbalances and poorly formed bones, particularly within the spine. Laptops are a nightmare for necks – the proximity of the screen to the keyboard encourages the head to slump forward. Have a plug in key board at home so that the screen of the laptop can positioned in front of the head. Encourage your child to shuffle around – Sitting for longer than 20 minutes in one position can cause damage to joints. Teach them to sit properly – There is no perfect way to sit, but avoiding crossing legs, tucking feet underneath the chair and slumping forward can lessen strain on young bodies. Tucking the chin in slightly and keeping the arms supported can also help. Lead by example – Taking regular exercise yourself is one of the best ways to encourage your child to remain active. If they see you sat in front of the television at night there is little doubt that this is what they will end up doing too. Ask for professional advice – A quick trip to the dentist is all it takes to teach your child to look after their teeth. A visit to the chiropractor can do the same for posture, lifting technique, and so on. Just like at the dentist, occasional check-ups can help spot and deal with problems before any real damage is caused.